What was once used as a small way to boost camaraderie during deployment has now become the centerpiece of the best bash of the year...we're talking Moustaches. During the month of March, the real men of our community will be growing a 'stache in remembrance of all the fallen soldiers that put their lives on the line for our freedom. 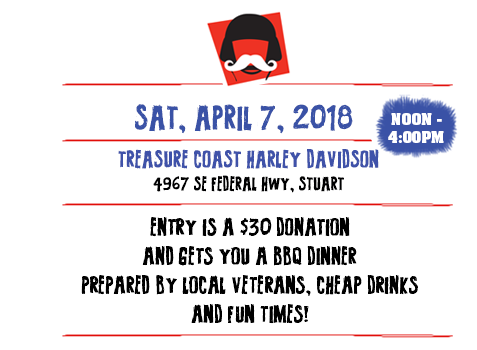 April 7th, bring your friends and your 'stache to the best bash of the year. The Great Moustachio Bashio! Local celeb judges will be on hand to determine who's The Man amongst the boys. Don't wanna grow? Don't worry. Just come to support your favorite facial-haired contender! Either way, don't miss this event! All proceeds benefit the families of fallen soldiers through The Station Foundation and Operation 300.